With the invitation to understand that happiness does not consist in having many things, but in being loved by Christ and in sharing his love. 1) Following Christ to answer to His love. In my opinion, the main theme of today’s gospel is to follow Jesus wherever He goes and whatever He asks. To the request of everlasting happiness that the rich man addresses to him, Christ, who offers himself as first and totalizing love, responds by making a request, or rather by proposing the vocation to belong completely to God giving all his riches to the poor. The man, at Jesus’ answer, becomes sad and leaves. Hence the teaching of Jesus regarding the fact that riches distract man from the desire to enter into communion with God. On the contrary, with God, everything is possible because those who follow Christ have and will have a new, bigger and wealthier family. This refers to the true reward, the eternal life in a future time, the one for which the rich man had asked Jesus. Christ continues to invite us to be with him always. Are we willing to welcome him in our existence? The offering of Jesus, of God, as the ‘first and totalizing love’ that must occupy all our life, can be rejected. How is it possible to refuse the offer to be loved and to love, especially if it comes from God? How can we avoid saying no to this demanding love and refusing to follow the poor love that makes us rich and free? Living the commandments, going beyond the literal execution of them and living them as indications of love. To follow Christ means to be willing to experience something more than the “thou shalt not steal,” “Thou shalt not kill”, etc. In addition to not doing evil, we should ask ourselves the question of how to do good and especially how “to be” real people in love. Jesus had already announced that to save his life one had to be willing to lose it for His sake. To follow him it is necessary to deny themselves and take up the cross (Mark 8.34 to 35). The gaze of Jesus is fixed on the rich man who asks him for the happiness of a life that lasts forever. How many times in the Gospels do we meet that look? It is a look that seeks (Mk 5,32), involves (Mk 3, 34), is indignant (Mk 3: 5), invokes (Mk 7:34), reproaches (Mk 8, 33), and observes (Mk 11,11). Here, Mark gives us the profound sense of the gaze of Jesus who does not seem to want to get away from that man, a gaze full of love. This gaze lies in the middle between dialogue and the final proposal. The dialogue begins with a request, that of having eternal life and of knowing what to do while expressing the limits of a religiosity based on observance. The proposal is to give up everything to follow the Lord. Here, in the middle, Mark places the depth of the gaze of the Lord that acts as a watershed between the request and the proposal and introduces a totally new dimension between the need to do and to become a disciple: communion. “A look that takes you up, and never leaves you there, eh? never. It never lowers you, it never humiliates you. He invites you to get up. A look that leads you to grow, to move forward, and encourages you because it loves you. It makes you feel that He loves you” (Pope Francis 09/21/2013). The rich man who came to Christ was genuine and earned a look full of love from Jesus, who seems to say to him “You lack one thing that is decisive for you. Renounce your possessions, invest in the treasury of the sky, and your heart will be free and will follow me. “But neither the look nor the words of Jesus had effect. This man, however saddened, preferred to return to the security of his own wealth. He could not or would not understand that he was offered a wealth incomparably more valuable and lasting of all its riches: the love of Christ that communicates the fullness of God (Eph 3.18 to 19). To the proposed fellowship, which was implicit in the request of Christ to follow Him, this man preferred solitude. Yet Christ had looked at him with love. Jesus looked at the rich man and Jesus’ gaze was like a caress, a kiss … the kiss that the master used to give to the disciple in Jesus’ time as in the case of Judas (Mk 14,45.). 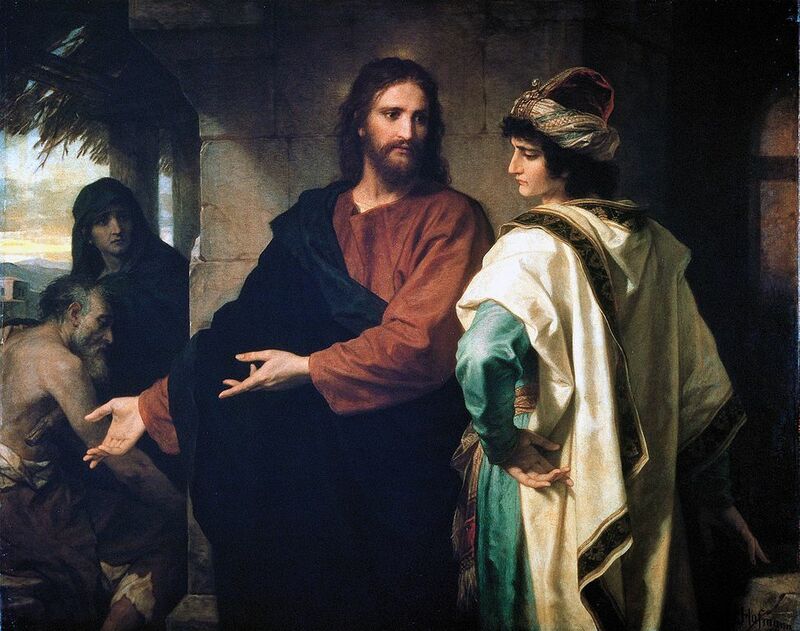 We could interpret this look as did St. Bede the Venerable, commenting on Jesus’ gaze on the publican Matthew (see Mt 9,9): “Jesus saw a publican, saw him being merciful with him, and called him telling him: ‘Follow me! '” (Homilies 21, CCL 122.150). Jesus said “What you do is right, but if you want to do something more, then go and sell your goods …”, but “You lack still one thing, leave everything and follow me” (Mk 10:21). That’s the point to where Jesus had carried the young man with his eye of merciful love. Unfortunately, this man did not believe in this look and in these words, he became sad and pulled back (see Mk 10 22). He did not believe in that look, did not believe in that love and was not able to follow him with the steps of the heart. Faith in God who is a provident Father. If He cares for the birds and the lilies of the field, He has even more care for each of us. Need for fraternity: how can we continue to own all that we have, when we realize that all around us there are brothers who lack the necessary? Need for freedom: if we are tied to too many things (and it is not just money) that absorb all of our time and our attention, how can we find the space and the taste for the things of God? Virginity is “poverty in love that makes it possible to have everything in a spirit of freedom” (Jacopone of Todi, “O amor de povertate”). Virginity is how to accommodate the gaze and love of Christ upon oneself, following him unconditionally, without asking for collateral security or have escape routes. One leaves everything even his own flesh to follow Jesus, without nostalgia and without hesitation, for the way that He is. The required detachment is a gain, a bargain, not a loss. This is very true even for a simple human thought: in the sobriety of those goods that the Gospel calls riches, there is the possibility of other goods much more important and human, essential for us like the air we breathe: time for God, the joy of brotherhood, liberation from the anxiety of possession, freedom, and serenity. Those who through virginity put God first in their life, become part of His “family”, where they find brothers and sisters to love, fathers and mothers to worship, houses and fields to work. They find love. Virginity is not a negation of love, but it is the fullness and totality of love. For this reason the Ritual of the Consecration of the Virgin prays: “Fervent in love, they prefer nothing to your love” (Prayer of consecration of virgins, in the Roman Pontifical, reformed in accordance with the decrees of the Second Vatican Council and promulgated by Pope Paul VI, Consecration of Virgins, Libreria Editrice Vaticana, Vatican City 1980, n. 38, page 77).